iReporter Omar Dakwala took this photo of the airport in Port-au-Prince following the earthquake. Spirit Airlines: "We don't know when we'll be able to get flights in and out"
(CNN) -- Airlines are uncertain about when commercial service to disaster-ravaged Haiti will resume. In the meantime, some carriers are organizing relief efforts. American Airlines canceled its five round-trip flights on Wednesday and Thursday. The airline is allowing passengers with plans to travel to Haiti this month to change their plans without fee or penalty through February 14, spokesman Tim Smith said in an e-mail. "We are completely out of Haiti today, no scheduled operations -- we don't know yet for how long," he said. American Airlines plans to offer its frequent flier program members mileage incentives for contributing to the Red Cross, Smith said. The carrier flew three American Eagle aircraft into Haiti on Wednesday carrying 30,000 pounds of relief supplies for airline employees and local hospitals and aid efforts. The airline plans to send more relief flights on Thursday and Friday. "The airport tower is badly damaged, and while I don't know the precise status of the runway, flights (including ours and Air France's) did make it out last night," Smith said Wednesday afternoon. U.S. Embassy staff at the Port-au-Prince airport said the tower and the lights were working, U.S. State Department spokesman P.J. Crowley said Wednesday. Spirit Airlines, which operates one flight a day between Fort Lauderdale, Florida, and Port-au-Prince also canceled Wednesday and Thursday flights. Customers with reservations for travel to, from or through Haiti between Wednesday, January 13, and Sunday, January 17, may rebook their travel without penalty, provided the new departure is on or before February 7, according to Spirit's Web site. The airline will waive the change fee for travelers who move their travel beyond February 7, but it will charge for any difference in fare. 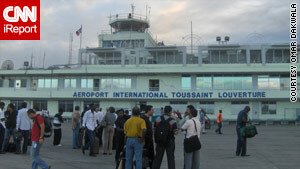 The airline plans to resume service as soon as the airport in Port-au-Prince reopens. "At this time we don't know when we'll be able to get flights in and out," Spirit spokeswoman Misty Pinson said via e-mail. The airline will give 5,000 free Spirit miles to the first 200,000 members of its frequent flier program who donate at least $5 to UNICEF, the Red Cross or Yéle Haiti. Members must register online to participate. Delta Air Lines has canceled its only flight Wednesday in and out of Port-au-Prince from New York's John F. Kennedy International Airport. There are no details on when the airline will resume commercial service, spokesman Anthony Black said. JetBlue Airways does not fly into Haiti, but the airline is waiving change fees and fare differences for passengers scheduled to fly into neighboring Dominican Republic on Wednesday. The airline's operations in the Dominican Republic have not been disrupted, but customers who don't feel comfortable flying can move their flights back, spokeswoman Alison Croyle said. Passengers who were scheduled to fly to, from or through Puerto Plata, Santiago or Santo Domingo in the Dominican Republic on Wednesday may cancel without penalty and receive a full refund or reschedule to fly Thursday or Friday with no fees, Croyle said.